Hungarian prime minister Viktor Orban. Demotix/David Ferenczy. All rights reserved. The voices of concern about the demise of a young democracy and condemnation of Hungary’s prime minister reached a crescendo in the West after Viktor Orbán declared war on “liberal democracy” in his speech of July 26 at Tusnádfürdő (Băile Tușnad in Romania). Some of those voices called for sanctions against Hungary and/or accused the EU of not doing enough to hold member states to the terms under which they joined the Union. I am reluctant to add my voice to those condemning the leader of my country. Rather, I would like to present an insider’s view of what could help Hungary get out of its present desperate predicament, and what dangers might await us if sanctions alone were imposed to stop Orbán on his way toward “illiberal” democracy and a “workfare state” (a la Mussolini et al?). First of all, we must note that Orbán did not simply threaten to lead us away from the most fundamental European values: he has already corrupted virtually all institutions of our not yet fully-rooted liberal democracy. Thus, the greatest danger is not what the once liberal Victor Orbán might do if he remains in power; that is predictable given what he has already said and done. The much more important question is: What would happen if possible sanctions led to a financial and/or political crisis before our civil societies - which he set out to destroy - were strengthened. Let me first mention the most dangerous aspect of our present predicament that might tear the country even further apart if a political vacuum were to develop. I refer specifically to the far right elements that for many years have described us in terms of “our kind” and “their kind”. 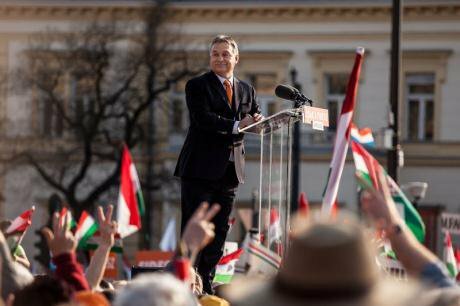 The greatest threat facing us and our neighbors is not Orbán's Fidesz per se, but the neo-Nazi elements that emerged from under its wings after Orbán used them to try to bring down the 2002 – 2010 social-liberal coalition that succeeded the first Orbán government. These far right elements formed, or at least helped form, Jobbik (jobb=right; jobbik=better), which, next to Fidesz, already has the second largest following, especially in the countryside, where people encounter little more than the Fidesz-controlled media. Members of the younger generation are easy prey for Jobbik, for they have no memory of how a weakened democracy can be led, even by a seemingly paternalistic autocracy, to the miseries of outright dictatorship ruled by fear. Going even beyond Orbán’s illiberal democracy, Jobbik’s leadership has already stated openly and proudly that it is not a democratic party. In all likelihood, Orbán’s talk of illiberal democracy and his war against the West is intended at least in part to win back Jobbik supporters. As he can rightfully assume that he must recapture a significant fraction of the far right if he wants Fidesz, which was voted into office with far fewer votes in 2014 than in 2010, to stay in power after 2018. These potential supporters of his include the most radical neo-Nazis, who are held together by the desire to accomplish what could not be finished in the shadow of WWII. These far right elements do not necessarily believe that gas chambers could be built again anywhere in Europe. Nor do they believe that the ethnic cleansing that took place in the shadow of the Balkan Wars just south of Hungary could be repeated here and now. Their approach is more subtle and can therefore attract even those who would be repelled by the thought of mass murder. From their rhetoric it is apparent that they want to “free Hungary of Jews and Gypsies”, not by killing them but by encouraging them with hate speech and other methods of harassment to leave the country. Against the Roma they even pose the more direct threat of the -- officially outlawed but for all intents and purpose tolerated -- paramilitary Hungarian Guard, members of which march in black uniforms through impoverished neighborhoods inhabited by Roma. Sanctions against Hungary can also provide ammunition for Orbán’s propaganda war against the West, which he uses to maintain his followers in the state of “fülkeforradalom”. In Orbánese parlance fülke (=voting booth) forradalom (=revolution) means that the 2/3 majority can turn everything upside-down as long as s state of revolutionary fervor is maintained. This is why Orbán always needs to find new windmills to tilt against. Financial sanctions would give him the broadest front to fight the West, while the destabilizing effect of pushing even more people below the abject poverty line would give Jobbik -- Fidesz’s right flank -- fertile ground to spread its poisonous teachings. It is understandable that the leaders of the West are primarily concerned with defending the rest of Europe against the spread of Orbán’s “illiberal democracy,” “unorthodox economy,” and “workfare state.” They may assume that this can be achieved by isolating the source of infection, but they seem to overlook the fact that -- wedged as Hungary is between East and West in the very center of Europe -- it is impossible to draw a “cordon sanitaire” around us until the sanctions achieve their goal of starving out the disease. After several earlier attempts to embrace liberal democracy, including the revolution of 1956, Hungary’s transition toward free elections and a market economy was helped along in the 1980’s, during Kádár’s gradually easing dictatorship, by western investments and financial support from private individuals, primarily by George Soros and the Soros Foundation Hungary established by Soros in 1984. Later, in the 1990s other private organizations, such as the Mott and Ford foundations and the Rockefeller Brothers Foundation, also helped Hungary move away from communism and take the rough road from a workfare state to free market economy. However, with the exception of Soros’ support through his various programs, these organizations have withdrawn from Hungary, moving on to regions of greater assumed need before the seeds of democracy could have grown firm roots here. Actually, the assumption that civil society in Hungary already had an adequately solid base to stand on its own might have been correct had it not been for the emergence of extreme radical right-wing political organizations. These were supported initially by Western neo-Nazi anti-Semitic organizations, but more and more also by Near Eastern Islamic fundamentalist-fanatical interests with clear anti-Western, and anti-Israel ultra-nationalist agendas. Where is Orbán coming from, and where is he headed? For those of us who have followed his transformation from a young radical-liberal into a make-believe conservative and then a power-hungry leader with no stable ideology, Orbán’s speech of July, which created quite a stir in the West, revealed very little or nothing new. His systematic attack on the institutions of democracy predated that speech by several years. More than two years ago I also warned in this forum that “The voice of liberal democracy needs to be preserved in Hungary." True, there were a few people in the West -- most notably Hillary Clinton -- who expressed concern about the apparent intention and expected effect of an already enacted new media law, the aim of which was to stifle independent voices in Hungary. However, such warnings were silenced by Orbán’s “do not pay attention to what I say, but to what I do” double talk. The standard government propaganda line invariably points out that Klubrádió, an independent station, is still on the air, as proof that freedom of the press is maintained under Orbán. However, as I described in my 2012 article, the government, with its long arm, had done everything already even then to destroy Klubrádió through financial strangulation and legal harassment. Since manipulation of the news is essential for his hegemony, Orbán will never give up his battle against the few organs of the media that still exist, but do not support him 100%, although recently there have been signs of cracks developing in his once monolithic media empire. The speech of July 26 included a declaration of war against independent media and NGOs that are critical of Orbán’s “centralized sphere of power”. This is very similar even if not yet identical to Putin’s treatment of independent organizations in Russia. Furthermore, the way Orbán brings up Eastern (semi)-dictatorships as examples to follow makes it clear that he wants to ride Eastern winds, while surviving on Brussel’s euros. In the meantime he attacks Western values and institutions in front of domestic audiences to flaunt his mettle in front of his worshipers. I use the word worshiper deliberately, since his supporters look upon him as a kind of demigod (dictators often receive this sort of adulation) rather than as a mere politician. He exploits this image irrespective of religious belief. Some of his speeches, in which he intermingles pagan, Christian as well as mystical, esoteric concepts, bear this out. One in particular revealed his messianic commitment in the service of a yet undeclared good. My analysis of this speech (available only in Hungarian) can be read here. Since he does not follow an identifiable, known ideology or spiritual creed, we would need to go into an in-depth analysis of his personality, motivations and internal conflicts before we could hope to understand what might emerge from his next conversion on his road to Damascus, just as his turn-to-the-right had been unpredictable before the great defeat of his left-liberal Fidesz in the 2004 election. Most political analysts – those who are apparently not familiar with the wretched fate of false Messiahs -- do not foresee the possibility of his defeat in the election booths in 2018, or as long as the present trends continue. However, as he seems unable to resist opening new fronts all the time – lately even within his own circles -- he may find himself exposed to one too many fronts way before the next election. Orbán’s new frontier against “foreign support” for our civil societies. First of all we must ask what Orbán considers “foreign money”. Right now people in the West are most familiar with his crusade against the Norwegian Fund for Civil Society Development, a crusade that led to massive police raids of NGOs that handle this Fund’s grants in Hungary and to harassment of the grantees. This can be regarded as a test case, and if Orbán’s government is allowed to get away with it, much broader attacks on all dissenters can be expected. While the support that arrives from the Norwegian Fund can indeed be regarded as foreign money, Orbán did not question the source of the money when George Soros financed his scholarship to Oxford and helped him in many other ways to become the young liberal leader he once was. Many Hungarian civil and charitable organizations received millions over the course of at least three decades from the foundations of George Soros. Since he was born and educated in Hungary until the age of seventeen, Soros is as much a Hungarian as he is an American or an Englishman. He is certainly more Hungarian then the leaders of Azerbaijan, for instance, whom the Hungarian Prime Minister obliged by “extraditing” Ramil Rafarov, a brutal political ax-murderer, who upon his return to Azerbaijan from Hungary was hailed in his country as a national hero. What the quid pro quo was for this gross abuse of justice we do not know, but it was a prime example of “treason” that Orbán and his henchman lately accuse civil advocacy or charitable organizations who receive donations from international foundations. We have to turn to such foundations because most Hungarians of means are reluctant to donate money directly to independent civil entities for fear of repercussions from government agencies headed by Orbán’s hatchet men. I see only one way to help Hungary get back on the road to liberal democracy: we must provide and seek funding for our civil organizations and independent media in order to ensure that they can survive in a hostile environment, and we must help establish new ones that can provide the “checks and balances” that were essentially taken out of our Constitution by Orbán’s Basic Law. Building a strong civil society and independent media takes money, lots of money that at present cannot be raised domestically, but not nearly as much as what might be needed to stop the spread of Orbán’s model of autocratic rule to our neighbors and to rebuild democracy at home after all of its institutions have been totally dismantled. Orbán clearly wants to prevent NGOs from receiving independent financial support because he knows well that a strong civil society and free media are the bulwark of democracy. In conclusion: what needs to be done? Individuals and organizations with influence and/or financial resources who do not want to see the demise of a young democracy and the spread of autocracy toward the European Union need to help strengthen and/or rebuild civil society in Hungary. Support need not come only in the form of donations. There are good opportunities now to invest in independent media to provide voices other than those maintained for government propaganda at taxpayers’ expense or financed by Orbán’s fellow oligarchs from the fortunes they reaped from lavish government contracts. Instead of, or in addition to, resorting to sanctions, liberal democrats of means and/or influence need to do whatever they can to help build up an independent media and provide financial support for democratic civil organizations in Hungary in order to help them survive Orbán’s siege. We must also work to prevent the spread of his teachings, because Orbán seems to count on shoring up his domestic position by extending his influence beyond our borders. This call is especially addressed to people of Hungarian birth or descent, whether living in Hungary or elsewhere, for Viktor Orbán regards all such people as part of the Hungarian Nation. Thus, he would not be able to condemn the contributions or investments from them as “foreign money” in his hatemongering propaganda campaign against those who don’t eat out of his hand. It should also be noted that when he objected to foreign ownership of our banks that helped rebuild the country after it almost went bankrupt in communist days, he said that he would settle for fifty-fifty Hungarian and foreign ownership. Hence he could not object to a similar distribution of investment in an independent media or in the funding of civil society. There are also foundations that can advise and assist those who wish to help a vulnerable small country that has contributed so much over the years in the realm of the arts, sciences, and modern technology that have enriched us all -- and stood up repeatedly for freedom, even against Soviet tanks, driving the first nail into the coffin of the monster of dictatorship, the specter of which is threatening us again.